Many years ago, a scholar and his son lived in the palace of China's first emperor. They discovered that the emperor was having a mysterious, giant hole dug. 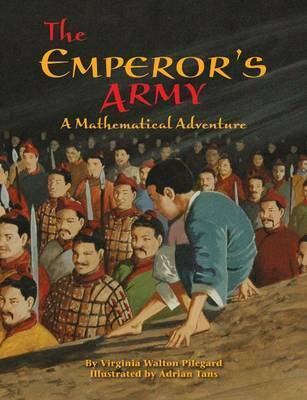 In this story, young readers will learn about the famous underground terra-cotta army that the emperor had made to guard his grave. Virginia Walton Pilegard wrote The Warlord's Puzzle as part of a teaching unit that uses informal geometry to strengthen students' visual learning abilities. Mrs. Pilegard studied elementary mathematics and completed both a B.A. and M.A. in Education. She then went on to teach elementary grades and in juvenile correction schools. Adrian Tans is an accomplished artist who also enjoys traveling. He is the illustrator of Pelican's Pirate Treasure Hunt!, Witches' Night Before Halloween, and Kick the Cowboy. Tans lives in Woodstock, Vermont.